A HEART Score of Five Is Low Risk? The HEART score was validated in Europe and is endorsed by the American Heart Association. However, no large prospective studies have been conducted in the United States. This study does just that and uses its results to revise what is considered “low risk” based on the newest ACEP guidelines that state that a 1% miss rate is acceptable. This study is unique in that it prospectively analyzed a very large number (n = 29,196) of ED patients with chest pain within the Kaiser Permanente Southern California system. The primary endpoint was 30-day mortality or acute MI. As the HEART score increased, so did the risk of adverse events. Using the graph below, the authors suggest using a threshold of 5 to identify patients safe for discharge from the ED since only 1.1% of those patients had adverse events within 30 days. Adapted from cited article, arrows added for emphasis. Despite its large, prospective sample size, the study is concerning in that its results clash with prior research on HEART. First, it had a much higher percentage of patients classified as lowest risk (HEART score 0-3 = 59% in this study vs about 35% in earlier studies), which makes me concerned a lot of HEART scores were calculated in patients who never needed to be risk stratified in the first place. Second, adverse events were much less common within each risk-stratified subgroup compared to prior research. For example, patients with a maximum HEART score of 10 had only an 11% rate of meeting the primary endpoint. 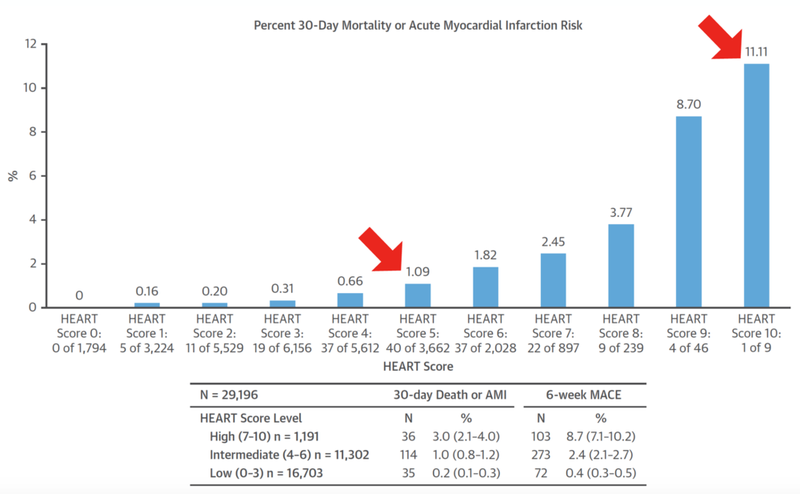 Since these patients by definition had a classic story and a troponin > 3x the upper limit of normal, how could only 11% have had an AMI within 30 days? The answer: Patients with an ED diagnosis of AMI (n = 807) were excluded from the study. ERCast, with Rob Orman, did an in-depth interview with lead author Adam Sharp that will air in March 2019. You do not want to miss this interview. I got a sneak peek (thanks Rob). The HEART Score for Suspected Acute Coronary Syndrome in U.S. Emergency Departments. J Am Coll Cardiol. 2018 Oct 9;72(15):1875-1877. doi: 10.1016/j.jacc.2018.07.059. After listening to the sneak peek interview by Rob Orman with lead author Adam Sharp, there were a few items that I thought needed clarification. They excluded AMI in the ED, which means they weren’t really using HEART, with a T, as other studies have. Because if the T was positive, they were likely excluded. Remember PARACHUTE? Exclusion criteria matter. Since this study is the outlier among the others, we need to be cautious as we apply its conclusions. They also used CRACE (clinically relevant adverse coronary event - meaning just MI or death) as the primary outcome. Other studies used MACE. Be sure you’re comparing apples to apples. My main takeaway is that if you get a HEART score of 5, not because of ECG or troponin abnormalities, then maybe that person is still at low risk of CRACE, though I remain very skeptical. Why so skeptical? Would I consider a 64 year old with highly suspicious history and ≥3 cardiac risk factors with normal ECG and troponin (a HEART score of 5) to be low risk? This seems to lack face validity to me. Personally, I do not plan to change my practice and consider HEART up to 5 as low risk at this point. Some may come to a different conclusion. Do you have thoughts on this study? Please comment.